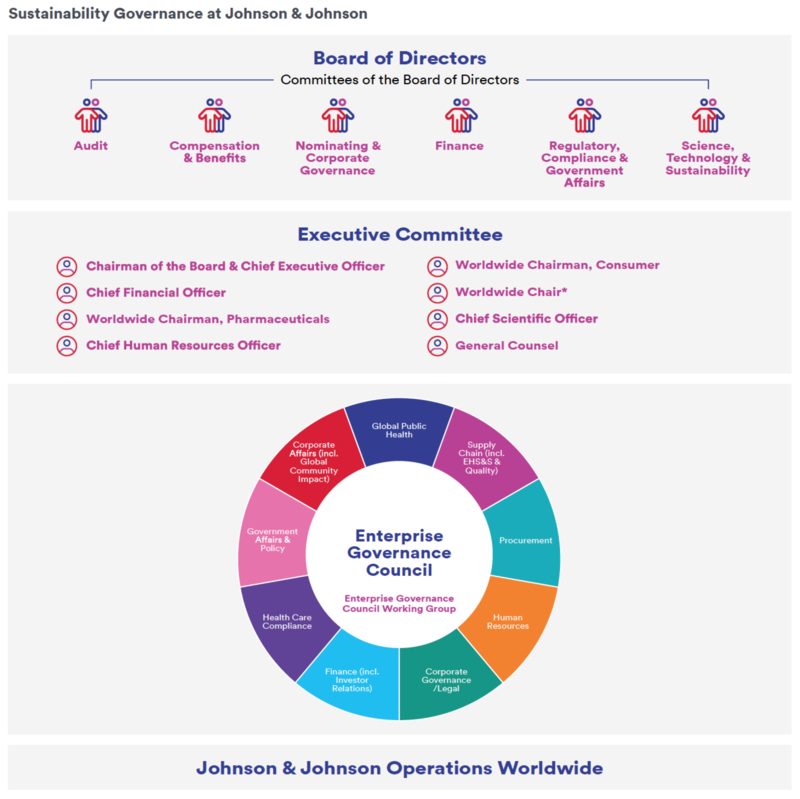 Starting at the Board of Directors level, the governance of citizenship and sustainability at Johnson & Johnson encompasses our three business segments (Consumer, Medical Devices and Pharmaceutical) as well as global enterprise functions. The Science, Technology & Sustainability Committee (STSC) has general oversight of our sustainability activities. 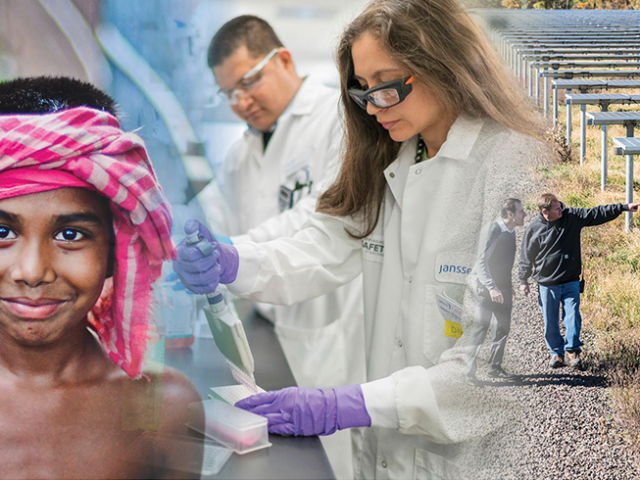 Along with our Johnson & Johnson Executive Committee, the STSC reviews annual progress against our Health for Humanity 2020 Goals and our overall citizenship and sustainability efforts. Select members of the Executive and Management Committees review the Health for Humanity Report. Our office of Worldwide Corporate Governance is responsible for raising visibility to citizenship and sustainability issues and activities that span multiple groups across the enterprise, and for facilitating connections between teams and departments. The Corporate Governance team also oversees key governance processes across the enterprise, including the Office of the Corporate Secretary, enterprise policies and statements, and engagement on key environment, social and governance (ESG) topics. In partnership with our Environmental Health, Safety & Sustainability, Global Public Health and Global Community Impact teams, Corporate Governance connects and aligns various activities that contribute to advancing our citizenship and sustainability agenda. To enhance our corporate governance structure, in early 2016 we established the Johnson & Johnson Enterprise Governance Council (EGC). The EGC is comprised of senior leaders who represent our three business segments and our global enterprise functions with line of sight to ESG issues. During 2017, the EGC formalized the process and protocols for this governing body, including the quarterly assessment of an ESG priority topics scorecard, proprietary reputational research on our identified ESG priority topics, and ongoing elevation of topics for further review and assessment. 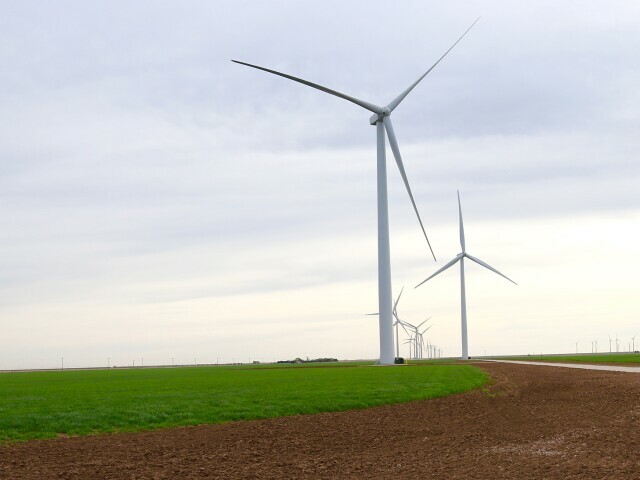 The EGC continues to drive increased preparedness for ESG issues management, and fosters alignment and coordination of internal and external engagement efforts on these issues. Another important function of the EGC is to review and support progress against our Health for Humanity 2020 Goals and United Nations Sustainable Development Goals (UN SDG) commitments. The Enterprise Governance Council Working Group (EGCWG) is the cross-functional “activation arm” of the EGC. The EGCWG is comprised of key enterprise functions and draws on the expertise of various subject matter experts across the Company, consulting with external advisors for additional specialized insight, as needed, to drive actions identified by the EGC. The EGCWG was re-chartered in 2016 to more effectively execute strategic plans for our priority topics. This diverse working group met six times in 2017 to review the status of key projects and emerging ESG topics and issues identified through our proprietary global intelligence system that analyzes which stakeholders, platforms and programs have the most impact on reputation. In addition, the EGCWG has accountability for tracking and managing the Health for Humanity 2020 Goals, UN SDG commitments, and our Health for Humanity Report, and works proactively across the enterprise to foster engagement around goal progress and commitments. In addition to people across the enterprise with formal job responsibilities related to citizenship and sustainability, thousands of employees around the globe support the implementation of our strategic citizenship and sustainability initiatives in their everyday work, and help us make steady progress toward our bold vision of changing the trajectory of health for humanity. * Responsibilities include oversight of our Consumer, Consumer Medical Devices, and Hospital Medical Devices businesses, as well as our operating infrastructure – Supply Chain, Information Technology, Global Services, Health & Wellness, Global Design and Health Technology.